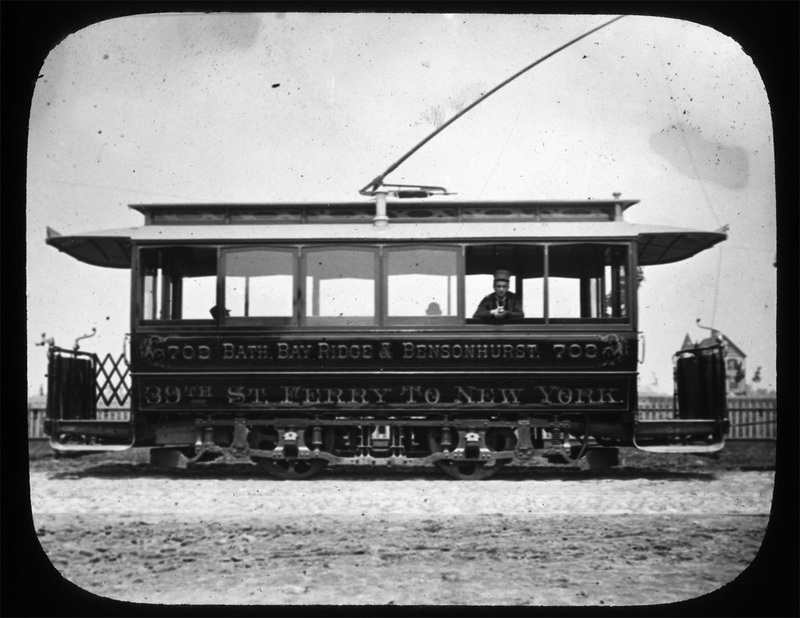 The electric trolley was said to be "##http://query.nytimes.com/mem/archive-free/pdf?res=FB0611FD3D5E10738DDDAA0A94DC405B8185F0D3##dangerous to property, man, and beast##." Norm Steisel, Louise Hainline, Iris Weinshall, and their anti-bike “Better Bike Lane” comrades aren’t the first well-to-do, politically connected bunch to wage war against a new configuration for Prospect Park West. According to a fascinating Curbed piece from the Weekly Nabe’s Keith Williams, another powerful NIMBY cadre once sought to undermine a nascent progressive transportation movement. In the late 19th century, the object of fear and loathing was the electric trolley. Williams writes that, at the time, Brooklyn was a smattering of separate towns, and railroad owner Henry W. Slocum saw an opportunity to provide residents with intra-city travel and access to the shore. Slocum had already electrified the five miles of track between Park Circle (the southwest corner of Prospect Park) and Coney Island. In 1891, he was looking to convert the Brooklyn portion of that line: straight up what is now Prospect Park Southwest, across the future Prospect Park West to Ninth Street, and down to Smith. But those living along Prospect Park weren’t having it. Their main argument was that electric trolleys would crush pedestrians without warning. Go figure: pulling a lever to operate an electric brake was more reliable than trying to get a horse to stop. There was also the fear of fire caused by falling wires, which had happened on a few occasions in other cities. The 500-volt supply was “enough to kill a regiment of men,” according to one electrician. Since then, however, safeguards had been developed to keep dislodged wires in place. The drama even had its own Marty Markowitz, says Williams: Congressman David A. Boody, a trolley foe who became mayor of Brooklyn. Ultimately, Slocum was granted approval from the State Railroad Commission, which said it “would not feel justified in withholding its approval in consequence of the protests or dissents of property holders upon certain streets.” Again, sounds familiar. Click over to Curbed for a spot-on takedown of NIMBY propaganda, which essentially has not changed in the last 120 years. As Curbed says, the lawsuit is still working its way through the courts. Has the Bloomberg Administration decided to allow the next Mayor to settle out of court to remove the bike lane, hide the records as part of the agreement, and then blame the judge? Streetsbloggers etc. keep treating this as a done deal. If I thought that in New York’s state and city government people were valued equally and the future mattered, I wouldn’t have left the public sector in disgust. All NBBL is asking for is what generations of insiders have expected: that their ownership of the world be respected, and that other people be gamed, exploited and treated with contempt. I actually think the worst thing in the world for the anti-bike crowd would be the removal of this particular lane. No one needs hundreds of Park Slope families standing in front of DOT crews with their kids. If Louise Hainline and Iris Weinshall think they’re despised in the neighborhood now… watch out. This would be terrible PR for Mr. Iris Weinshall himself, Chuck Schumer. Moms and dads laying their bodies down across a bike lane while a guy with a jackhammer tries to get through? Good luck, NBBL! It would probably motivate the pro-bike community across the city like never before and draw even more people to the cause. Not that we can take anything for granted, but the bigger risk is stagnation to the network overall. Very true. That could be the one thing which would unite cyclists and those sympathetic to them to the point the gloves come off. Right now a lot of people bike, at least once in a while, but few bother getting involved in cycling advocacy on any level. Even for me, posting on sites like this is the extent of my involvement. However, seeing the significance of this lane, I’ve little doubt I would be there protesting, even though the trip would be pretty arduous for me (~20 miles each way). I have nothing to lose personally if this lane was removed. I’ve never seen it, much less use it, but I realize its removal could be a pivotal turning point in the entire livable streets movement. I’ve little doubt others would feel the same. In the end, you might have tens or hundreds of thousands of angry people converging on that one spot. And we can’t have trolleys now either, because “important” people don’t like them. There is a bigger risk that stagnation — disappearance. Riding back and forth to Citifield, a lot of those bike lane markings are fading away, and pavement quality is a lot worse than it is where I usually ride. Just to make point that it isn’t a conspiracy, pavement markings for drivers are fading away too. Just part of the cutback in maintenance after years of borrowing for it. Perhaps some time soon DOT should be more selective about expansion until it has re-striped what we already have. We don’t even have the bus, thanks to years of borrowing for ongoing maintenance. Certainly not a conspiracy – at least the fading isn’t. Maybe the generally lousy street maintenance is. It shouldn’t be an issue at all. Bike lanes belong on space contiguous with sidewalks, between parked vehicles and pedestrians. Delineating them is as simple as using a different material, perhaps a brick instead of concrete, no paint needed. It actually rather flabbergasts me that so few people understand that, even on StreetsBlog of all places. Actually, concrete would be perfect for bike lanes as far as delineating them from the asphalt streets goes. A second plus of concrete is slightly lower rolling resistance compared to asphalt (i.e. I’m consistently about 1/2 mph faster on concrete). On top of all this, concrete bike lanes should last just about forever unless tree roots lift them. Come to think of it, we should probably by building the roads of concrete instead of asphalt if the aim is to keep them in reasonable repair. Asphalt roads are just too fragile for the level of traffic we have in the city. You could still delineate bike lanes from roads even if both were concrete by coloring the concrete. That’s a far better solution than thermoplast which wears off after a few years. I only suggested brick because it’s a different material from already concrete sidewalks. But any difference works, even concrete in a different pattern. The important point is getting bikes off the “road,” where people park in their ROWs and bikers get killed. Asphalt is ugly, smelly, and prone to wearing out – one more way the auto-coddling cretins make the world crappier for everyone else. I’m 100% sure this is the MAIN reason why we don’t just rebuild streets the right way out of concrete once due for rebuilding, instead of cutting them and repaving them. And I don’t doubt ConEd is a factor in this as well. No sense making a nice new concrete street when ConEd will break it up a week after it’s done. You would think by now we could have had some sort of standardized utility trenches, perhaps running right next to the curb, so that breaking up streets for maintenance would be a thing of the past. And I’m sure part of the reason for this situation is to give make-work jobs to ConEd workers, along with the make-work jobs for street repair crews plus anyone involved in the asphalt business. That said, I think as oil gets more expensive, we’re going to switch en masse to concrete purely for economical reasons. We really need to take a page from the Romans-build things once and build them right. Some 2000+ year old Roman roads and aqueducts are still in service. In any case, it makes worlds of sense to separate bike paths, and also to rebuild the pavement in a different color/pattern. Besides the obvious visual demarcation, pavement which only bikes pass over should last virtually forever, especially if it’s concrete. Prefab sections that can just be craned up for a short period of time would save ConEd too. As it is now, each utility needs to have its own hole. If ConEd digs, ConEd fills and Verizon has to then dig its own hole. They can’t just share. The trolley tracks are still there! They were not removed in 1951. When DOT cut into PPW and GAP to install the full pedestrian/bike crossing islands, the tracks were just under the asphalt surface and small sections had to be cut away to install the relocated traffic signal wires. A little judicious pavement scraping and the rails would be exposed from GAP to Park Circle. The streetcars were on PPW longer than automobiles were on PPW. The 5th Ave and 7th Ave trolley tracks are also just under the pavement. Eyes on the Street: Union Street Trolley Tracks Exposed!